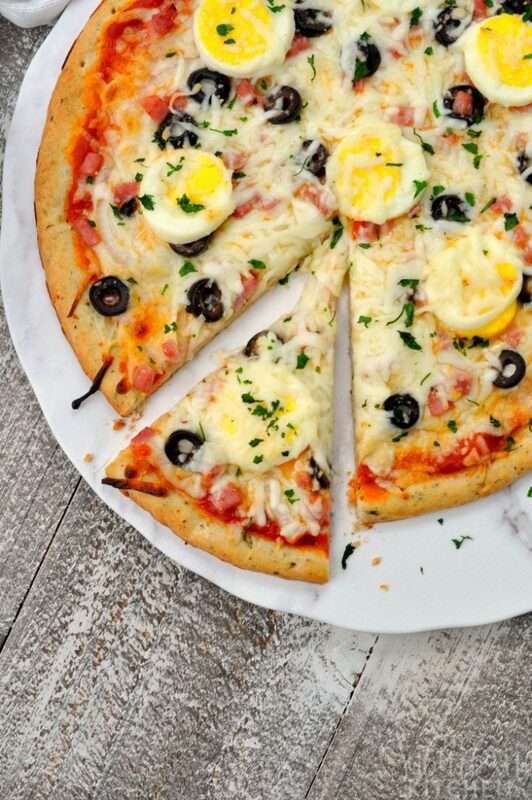 Add a little variety to your next pizza night with this Brazilian Pizza recipe. With just a few delicious ingredients, you can make piefection right at home. 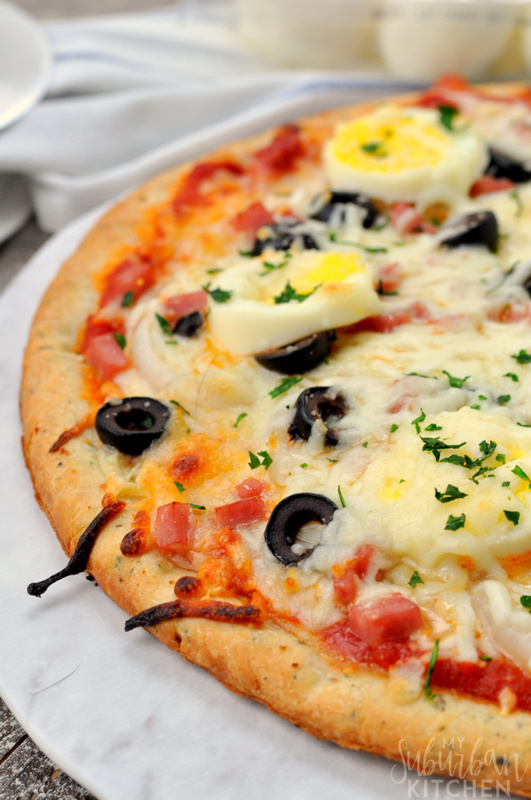 A Brazilian pizza, also referred to as Portuguese pizza by some, is a delicious combination of classic pizza sauce, ham, onions, olives, cheese, and hard-boiled eggs. It is perfect for changing up pizza night and introducing the family to something different. I first learned of Brazilian pizza while checking out the menu at a new restaurant in town. I remembered the addition of hard-boiled eggs and so decided to make it when I had extra eggs to use up at home. In some parts of Brazil, ketchup is used as the sauce. 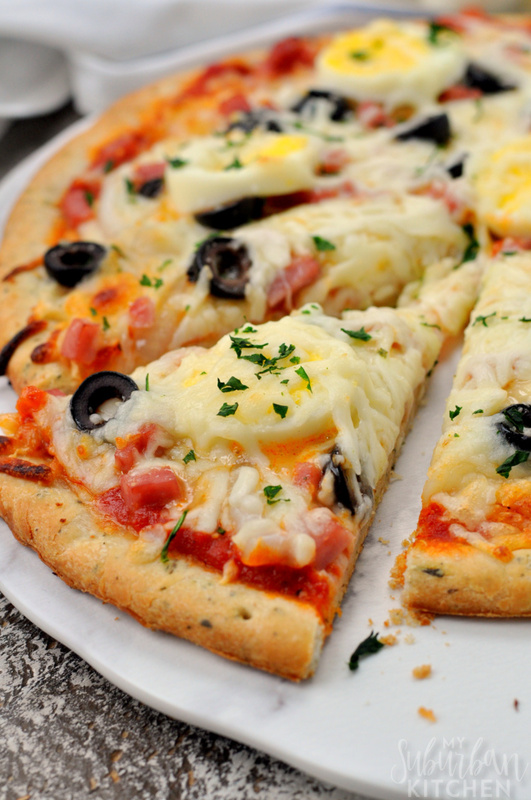 The pizza typically includes creamy Brazilian cheese in some form. 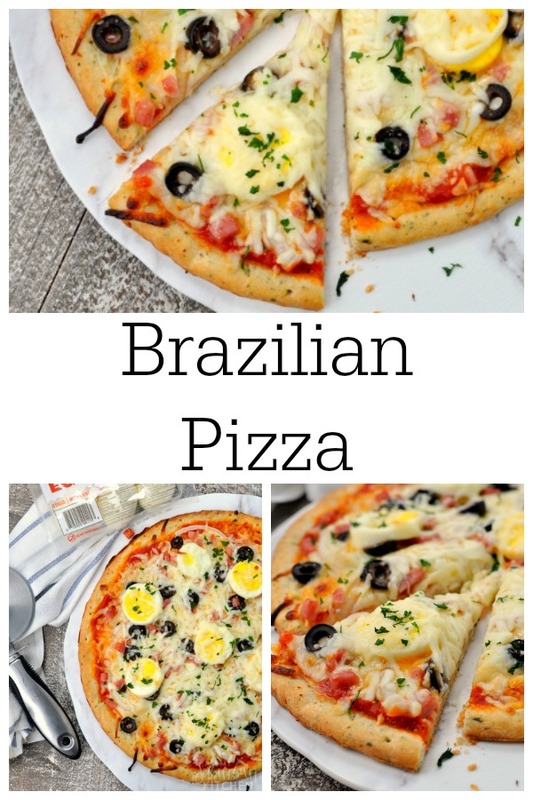 This recipe is definitely a more Americanized version of a classic Brazilian pizza but I did use a very thin crust and a chunky pizza sauce to try and mimic some pieces of the classic recipe. I have made the pizza with both sliced ham and cubed ham. Both are delicious so go with our preference. You can also choose your favorite type of sliced olive when picking ingredients for this Portuguese pizza. If you make this Portuguese pizza or any recipe from the blog, I would love to hear about your experience. Let me know in the comments or snap a photo and tag it #MySuburbanKitchen on Instagram and Twitter. Spice up your pizza night with this classic Brazilian style pizza recipe. Preheat oven to 425 degrees. Place pizza crust on baking sheet. Spread pizza sauce onto crust. Top with 1/2 cup shredded mozzarella cheese. Add olives, onion slices, ham, and hard-boiled eggs. Top with remaining cheese. We love pizza! This is a nice change from our typical pizza night fare. Thanks for a great recipe! This is such a n interesting way to switch up pizza night!